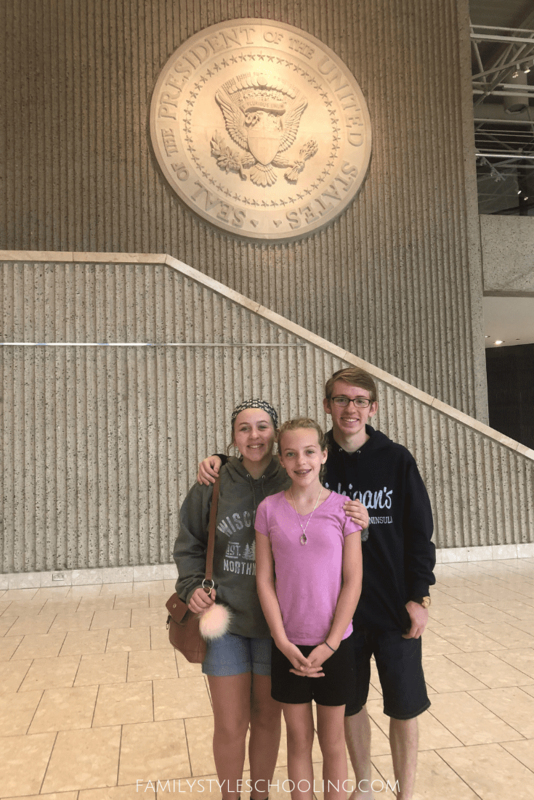 Last year when I visited President Nixon's Library, I felt like I got a glimpse into the other side of the story that my history textbooks didn't tell me. It's not like I condone what he did, but I see how dangerous it is to put a man up on a pedestal and ask him to stay there. Nixon was an excellent leader, but the pressure of the politics and the men he surrounded himself with wore him down over time. A series of unexpected events put Gerald Ford, a humble servant of his country, in the most powerful seat possible. Ford grew up as many former presidents did in humble beginnings. Even though his father wasn't a man of integrity, Ford learned about service and honor from his participation in the Boy Scouts program all the way through becoming an Eagle Scout. Additionally Ford was quite an athlete. He played college football and even turned down job offers from the Detroit Lions and Green Bay Packers because he wanted to study law. He attended Yale and became a lawyer in 1941 to serve his community. At the time, he was part of a group that was petitioning for the US to not join in the fight with Germany. His desire was for the United States to stay out of the war in Europe. 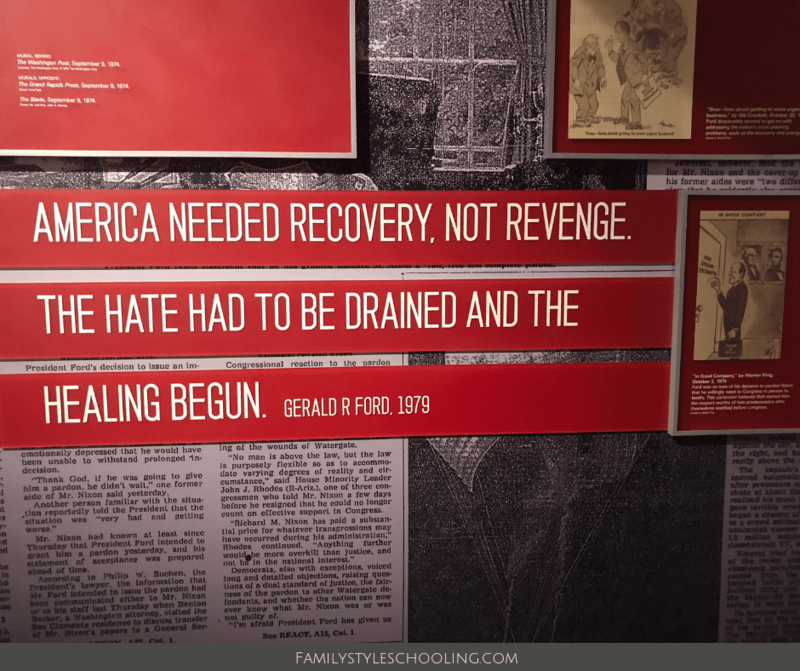 However when the Japanese bombed Pearl Harbor, Ford didn't hesitate to enlist in the Navy, and he served his country for the next five years. After his honorable discharge from the Navy, Ford met his wife Betty, and they were married just after he was elected for his first of 13 terms as US Representative in congress. No one thought he could win, but that didn't stop him from trying. His dream job was to be Speaker of the House. He did become the House Minority leader in 1963 and held that position until a new job opening came into view after some unexpected events in Washington DC. Ford, a Republican, finally had a Republican president—Nixon—to support as a member of the House of Representatives. Unfortunately, Vice President Spiro Agnew was not a man of integrity. His previous indiscretions in managing his money led him to resign his office leaving an opening in position of the Vice President. Instead of getting his dream job, Ford was nominated for Vice President. He was actually the only one recommended to Nixon by his advisers to appoint to the position. This was the first time the 25th Amendment of appointing a Vice President had ever been implemented. What Ford didn't know is that the corruption in the Executive Branch extended deeper, and his acceptance of the Vice Presidency would be short-lived as six months later he was sworn in as the President of the United States. Gerald Ford was the only man in history to become the President without having been elected into either the position of Vice President or President, yet he became the leader America needed after the discovery of unexpected corruption. He was a man of integrity that was placed in power in a time of need. 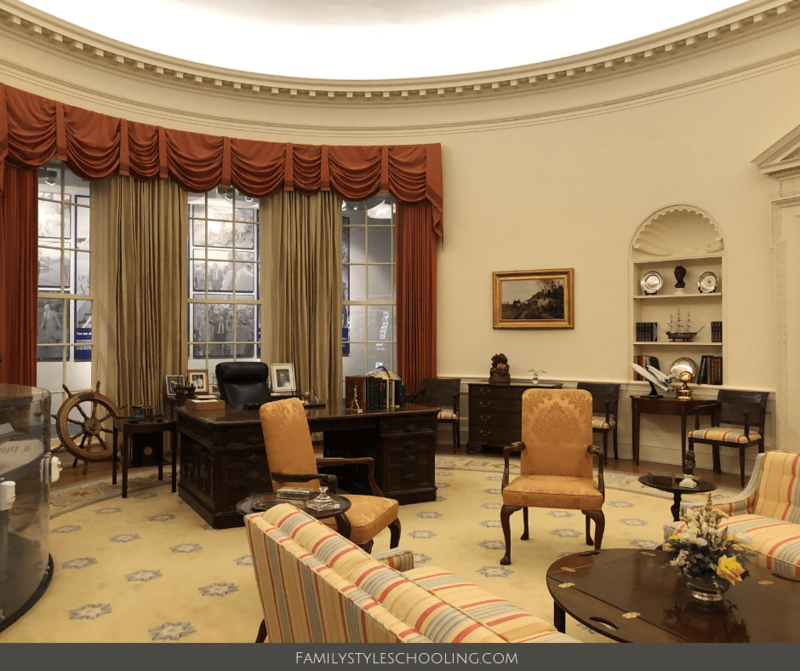 Even though his presidency only lasted 895 days, he took his position very seriously and strove to serve his country to the best of his ability. One of his most controversial acts as president was to pardon Nixon. His aim in this pardon was to promote the healing of the nation and not the harboring of more hate and revenge. Even though he ran for president again, he was beat out by Carter by a small margin. Of course Ford never stopped serving his country. The legacy he leaves behind is one of integrity and courage. He lived a honorable life in the midst of great temptation towards corruption. It was his commitment to service that put him in the most powerful position in his country. 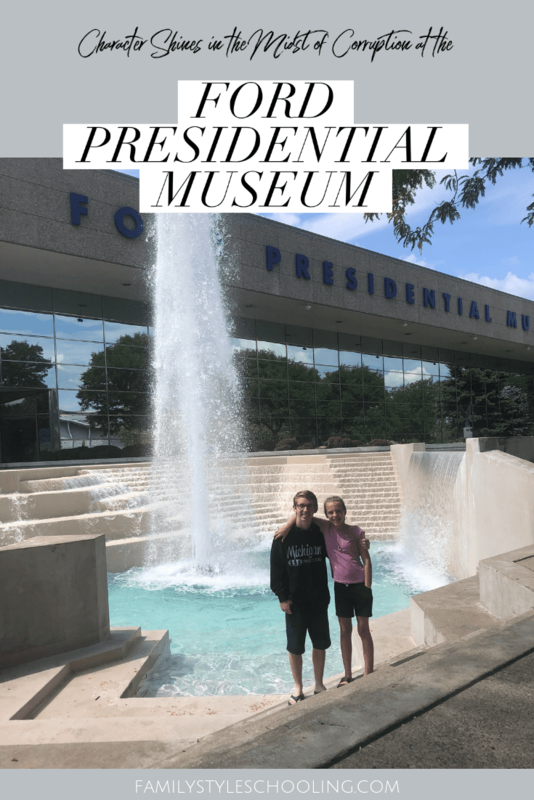 Even though Ford's presidential term was short, there is still a great deal you can learn from visiting Ford's Presidential Museum (in Grand Rapids...the library is in Ann Arbor, MI). 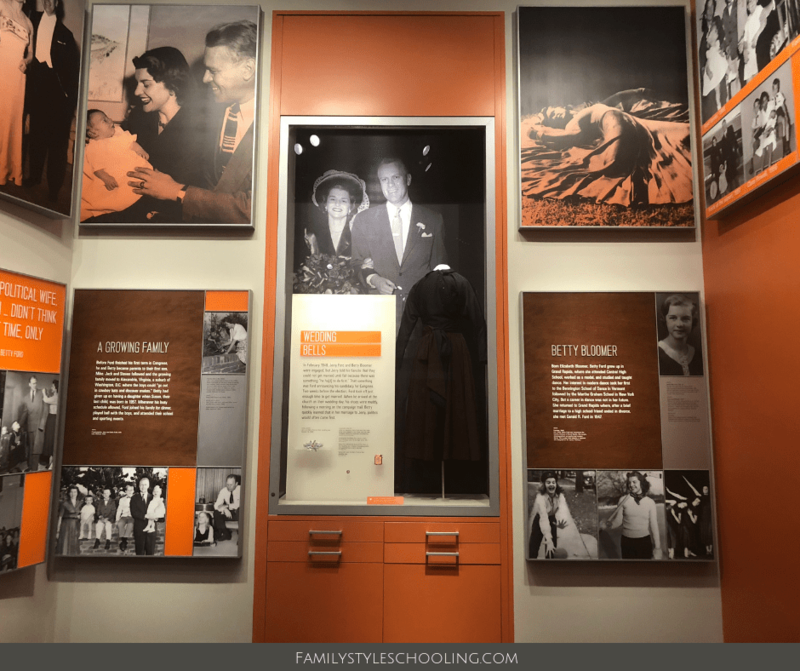 Above all, the character of this man standing tall throughout his lifetime is one of the most valuable lessons from this exhibit. 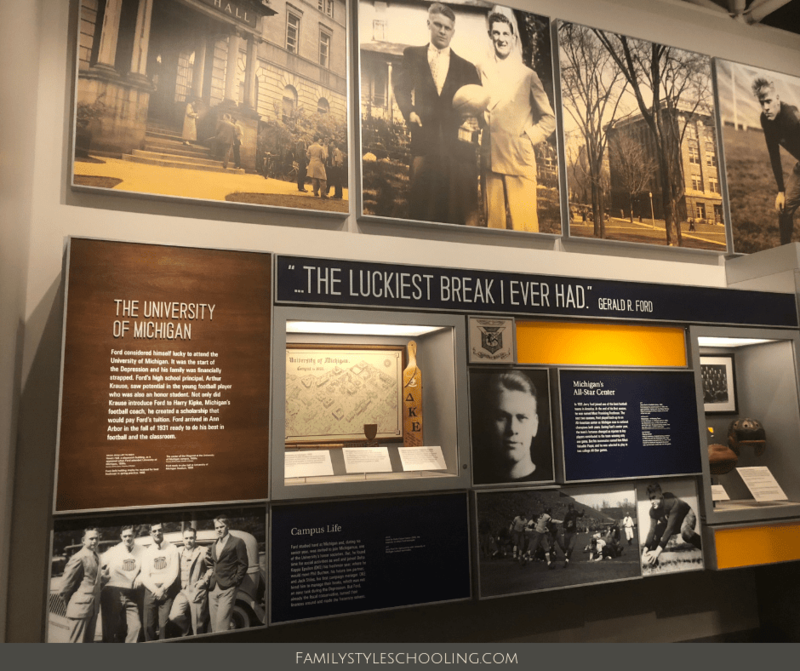 If you find yourself passing through Michigan, you really need to check this one out!